Free Shipping Included! AMMEX - BX3D46100 - Nitrile Gloves - Disposable, Powder Free, Latex Free, 3 mil, Food Safe, Large, Black (Case of 2000) by Ammex at Blog Free Here. MPN: BX3D46100. Hurry! Limited time offer. Offer valid only while supplies last. BX3D Black Powder Free Nitrile Gloves are fully textured for a sure grip, wet or dry. They combine excellent dexterity with outstanding performance. BX3D Black Powder Free Nitrile Gloves are fully textured for a sure grip, wet or dry. They combine excellent dexterity with outstanding performance. BX3D Black Powder Free Nitrile Gloves are powder free to protect against flaws in paints, finishes and sealants caused by residual glove powder; and latex free to eliminate issues of latex or rubber sensitivity. Great for food processing, light janitorial or manufacturing. 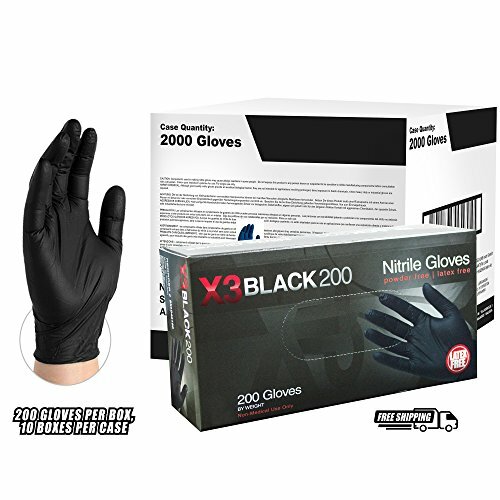 BX3D Black Powder Free Nitrile Gloves are sold 200 gloves per box and 10 boxes per case. Made from component materials which comply with FDA regulations for food contact. 21CFR, 170-199.